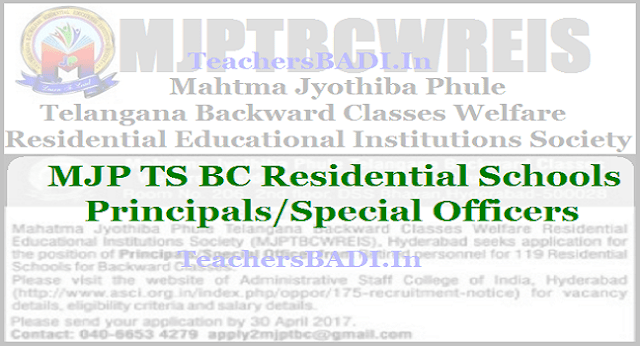 MJP TS BC Residential Schools Principals/Special Officers Recruitment 2017, TS BC Gurukulams Principals/Special Officers Recruitment 2017, Download the application form of MJPTBCWREIS Principals/Special Officers Recruitment 2017, Last date to apply for Principals/Special Officers Recruitment 2017. Mahtma Jyothiba Phule Telangana Backward Classes Welfare Residential Educational Institutions Society(MJPTBCWREIS) hyderabad has published the Principals/Special Officers Recruitment notification for 119 TS BC Residential Schools for Backward Classes. MJPTBCWREIS invites the application forms from the interested retired personnel for recruitment of Principals/Specail Officers. 3. Candidates must have passed B.Ed., or M.Ed., from an institution recognized by UGC. 4. Knowledge of Computer Applications is desirable. 2. Attested copies of (i) proof of age, (ii) SSC certificate, (iii) Degree Certificates for PG and B.Ed, (iv) Permanent Community Certificate or Caste Certificate (iv) Proof of Residence.